Casey Henry teaches banjo on several of our DVDs, and can be seen playing rhythm guitar on many others. Casey was born in Florida, where she resided until her eighth year, when her family moved to Winchester, Virginia. Raised in a family of musicians, Casey's first instrument was ukulele. She quickly moved on to piano, then flute, which she played in her middle and high school bands. At age 12 she started getting interested in bluegrass and took up the bass fiddle, joining her parents' band at 14. The next year the course of her life was irrevocably changed when she started playing banjo. 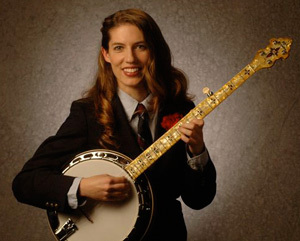 Following in her mother's footsteps, Casey studied the playing of Earl Scruggs with a passion, often driving long distances and camping in her beloved pickup truck at bluegrass festivals. She played in a succession of local and regional bands throughout high school and college. Upon graduation from the University of Virginia she recorded her first CD, "Real Women Drive Trucks," and then moved to Nashville to pursue a career in music. Since August 2009 Casey has been playing with The Dixie Bee-Liners, but she has worked with quite a list of other bands: June Carter Cash, the Jim Hurst Band, Pat Flynn, Lizzie Long, and Uncle Earl. She played a two-year stint with Tennessee Heartstrings before forming her own band with her brother Chris, Casey and Chris and the Two-Stringers. The Two-Stringers recorded a CD, "Get Along Girl," before disbanding in August of 2007. Along with playing music, Casey is active in teaching banjo, giving private lessons in Nashville, and teaching at camps around the country. She has taught at Banjo Camp North, Steve Kaufman's Acoustic Kamp, and the Augusta Heritage Workshops Bluegrass Week, among others. She also works as a freelance writer and has been published in in Bluegrass Unlimited, Bluegrass Now, Women in Bluegrass Newsletter, and Pickers in a Jam, the newsletter of the Banjo in the Hollow Club. She writes a monthly column for Banjo Newsletter. You can find more info about Casey on her website: caseyhenry.net.